In growing economies like Vietnam's, we are seeing innovations in business--through both national and foreign investments. But the government, almost 40 years after the US left, is also empowering social enterprises with its reforms. I can't wait to get back to Vietnam next week! But not to see the charming beaches or taste the delectable cuisine. Not even for its rich cultural history, per se. My focus is this growing population of entrepreneurs. After my visit to this beautiful, thriving country last fall, my fellow entrepreneurship enthusiasts invited me to participate in two-day conference over Skype. The seminar promised to discuss all of the important factors effecting social enterprise today, and I was set to give my own tips on entrepreneurship for students. My first time skyping into a conference! The first day of the event focused on the kinds of innovative social enterprises flourishing today in Vietnam. I was impressed by all the participants, but particularly struck by Blind Link, an organization that teaches blind people massage therapy. Wow, I thought--an ingenious way to empower these entrepreneurs towards a sustainable livelihood. After the political uncertainty of several decades, both Vietnam and Cambodia have reinvented their government system. In Vietnam, this reinvention has encouraged the entrepreneurs and innovators that had been so violently lost, and with great success. The tourism industry, for instance, is booming, with nowhere to go but up. At the same time, the economy being fostered in Vietnam has bred many significant charitable missions. 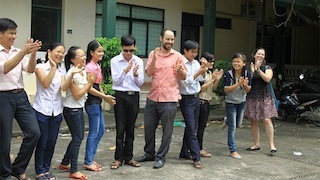 I was blown away by the passion and creativity of one such social entrepreneur, Huong. But it was the inventiveness of the mission that I want to share with you. 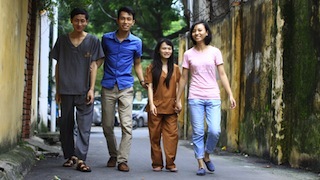 Huong cofounded Blind Link, which aims to empower visually-impaired Vietnamese with a new skill--in this case, massage therapy. Worldwide, the wellness industry--of which massage therapy is a part--is worth 4 Trillion. One in seven tourism dollars is spent on wellness. It is estimated that globally the massage industry will grow upwards of 20% in the coming years. In Vietnam in particular, tourism and its younger cousin the spa sector are ready to soar, ripe with potential for a population of born entrepreneurs. At the same time, there is a formidable history of blind massage throughout Asia (see here, here, and here). Blind Link supplements that rich tradition with counsel on how to start and run an independent business so the participants can benefit from new skills in both the short and long term. The outcome is outstanding! For instance, a continuing education course for 50 students can help to empower 50 new entrepreneurs in the massage therapy field. That, coupled with the growing tourism industry, can only help more business owners take hold of their futures. The next day, I was fascinated to learn from social entrepreneurs aged 18 to 35--all of whom were involved in truly unique activities. But--as surprising as it might sound--it was Vietnam's tax code that really caught my attention, and I will detail that here tomorrow.